Discussion in 'Stove Forum' started by ton visser, Nov 8, 2018. God morning, I bought a Primus 57 a few weeks ago, in rather good shape. The pumpleather was dry, easy to fix. 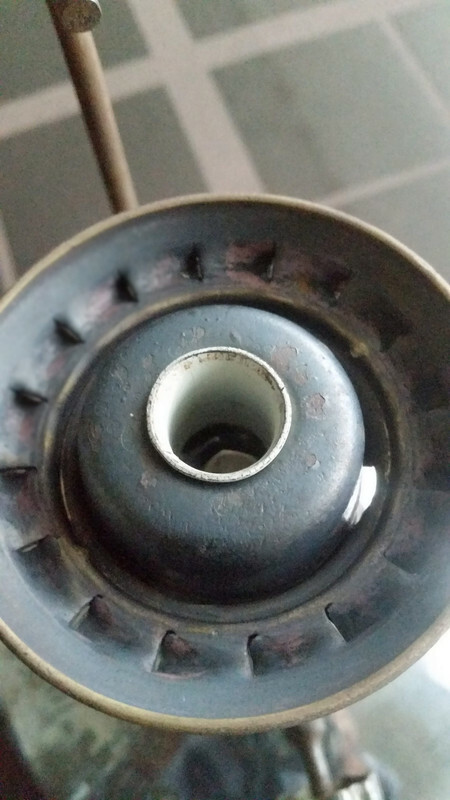 The cleaning needle was gone, no big problem.But when I started reading on ClassicCampStoves I found out there should be a rather special inner cap on the burner, where on my 57 was a common inner cap beneath the correct outer cap. It should be inner cap No 4679. Then I began to create something I thought might work but it did not, there were flames aside trough the four holes from the burner house. You can see a white spot in the next picture, that is one of the four openings in the burner. As you can see I made some sort of tube, widened one end a bit in order to make it look like a No 4679 inner cap. I used a common inner cap and slided the home made tube in it. The problem is it lies to deep into the burner, a No 4679 inner cap seems to have some sort of ring and I suppose that ring is as wide as the outer cap so no gas should leak aside. I suppose it would be to easy to ask where to buy a number 4679 inner cap? But maybe one of you have a suggestion how to solve this. Are there more stoves using the same burner? 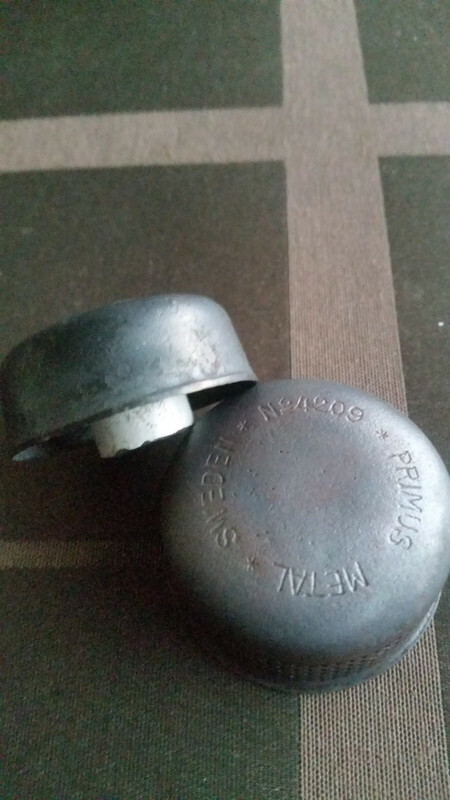 I am confident about the fact that Phoebus 625 and the russian shmel stoves use the same inner and outer caps style as Primus 57/107/110. 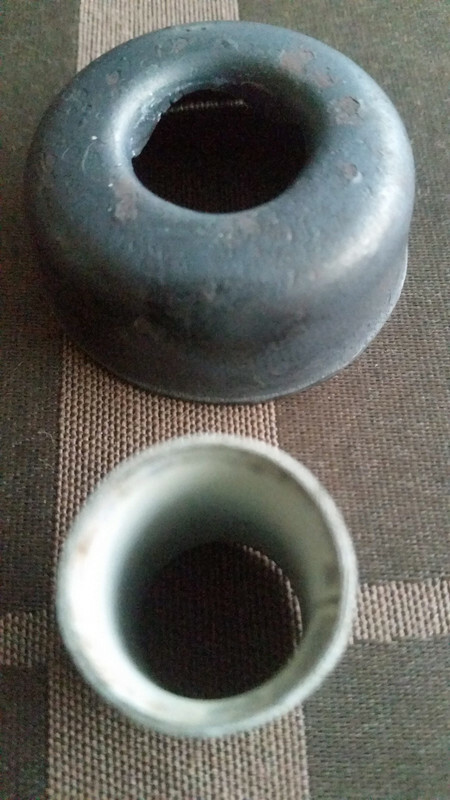 I am looking for inner and outer caps too, but at the moment I wouldn't like to buy a complete stove just to get the caps for another one. So I am interested too if someone knows where to get some of these parts. Korean stoves also often have same type inner cap (for silent use) because same burner head works for roarer & silent use. Maybe then DIY is only option. What would be the main reason the flame is that yellow on top? And because Afterburner mentioned the Primus alcohol burner No 3025 I began to wonder am I using the right fuel for this kind of burner? And is it really a lipstick burner with the removable jet? I use what we call petroleum in Holland, would that be kerosine on this forum? Can I find some sort of list here or elsewhere on the internet where to read which fuel is suitable for which burner or lamp? Many questions, but as it is I thought give it a try, have a nice day. I meant but as it is Sunday I thought I give it a try. 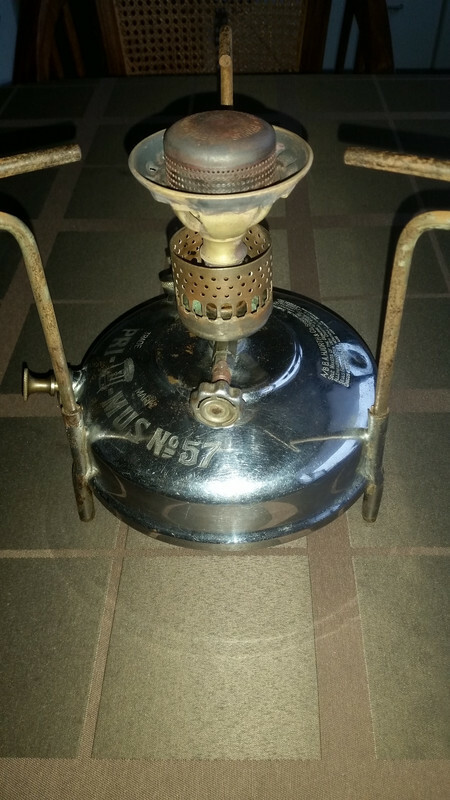 Hi @ton visser i believe that you have a Primus #4047 kerosene burner. This uses a lipstick-type vaporiser and the burner has silent caps, #4679 for the inner, and #4209 for the outer. 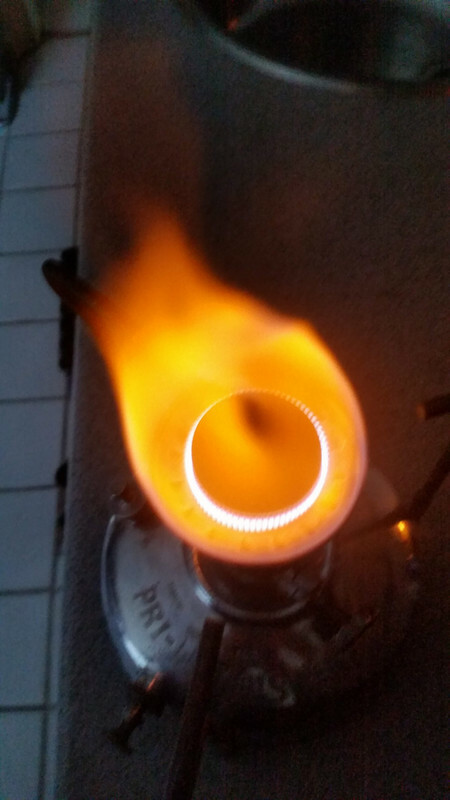 Orange flames or glow, such as you show is generally the result of burning a fuel-rich mixture in your burner. On rare occassions sodium or common salt contamination can also give you a yellow flame... think of the colour of sodium lights. Thank you for the answers so far, I will keep fettling. The most frustrating fact of the day is I found an innercup No 4678 on a Swedish website, unfortunately I am in need of a number 4679.